Duck Dynasty fans’ favorite Uncle Si Robertson, who says God has a sense of humor because he’s turned four disheveled-looking Christian guys into reality television stars, will be releasing his new book next month. Si Robertson, the youngest brother of family patriarch, Phil Robertson, works at Duck Commander where he’s been making the reeds for duck calls since his retirement from the U.S. Army, and shares anecdotal advice and stories about life in his book, titled Si-cology 1: Tales and Wisdom from Duck Dynasty’s Favorite Uncle. Phil Robertson’s brother, who’s known for his storytelling and for saying that he carries three items along with him everywhere he goes: tea, the Tupperware cup his parents sent to him during the Vietnam War, and his Bible, told LifeWay that the Robertson family gives God the glory for all of their success. “Hey, it’s unreal,” Si explained. Speaking about God, Si Robertson said that although a lot of people don’t believe God has a sense of humor, he quipped that the lives of the Robertson men is proof that He does, and in abundance. He then turns the tables on nonbelievers and asks what it is they depend on for support when they receive bad news, such as receiving a diagnosis of a terminal illness. 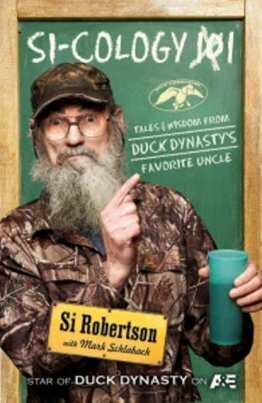 Si Robertson’s 240-page book that will be available on September 3 will include family photos, and anecdotes and stories about his childhood, duck hunting, his days in college, the Vietnam War, and his wife, Christina, and their two children, Scott and Trasa. Duck Dynasty Season 4 will broadcast at 10 p.m. EST on Wednesday, August 14.